This is the twenty-sixth, and last, in this series of 26 posts, one for each letter of the alphabet, that I am writing during the Blogging from A to Z Challenge, April 2016. You can find all the posts, as they are published throughout the month, by following the A-to-Z April 2016 tag. Zanshin [ZAHN-sheen] is a state of ongoing attention – complete presence. Fully engaged in the task at hand. Vigilant. Detached. Relaxed. Ready. Literally, zanshin means remaining mind, or lingering spirit. An awareness that continues even after a thing is done. Zanshin encompasses many things, from being aware of our surroundings, to feeling another’s intentions. Zanshin could be knowing who’s nearby as we walk to our car, or maintaining our connection with our partner before, during, between, and after techniques, watching their position, body language, and expression. It needn’t be martial, either. The term can equally apply to handling items or performing actions with care and respect – receiving a business card with both hands, folding clean towels in a way that they will be ready to hang when needed, or gently returning a fiddle and bow back to their velvety case after playing. Zanshin is an state of mind that is physically demonstrated in the way we stand and move, in the direction of our gaze, and in how we relate to others. Zanshin is not an idea, it’s an embodied state. What you might see if you’re watching people at the dojo, for instance, could include someone keeping their attention and alignment on their partner after completing a technique. Internally we are also feeling our own body, and noticing our state of mind. Are we open and calm, settled down into the ground beneath us? Or are our shoulders up around our ears, arms reaching aggressively forward? We try not to turn our backs on our partners, distract ourselves with a piece of loose thread on our uniform, or glance away at the clock. You might also see it in our handling of weapons. We set them down – we never casually drop or throw them. In sword work you can see zanshin in the way the blade is returned to the saya [SIGH-uh], or sheath, with great care. In practice of free technique, we kneel and bow to our partners at the end rather than casually walking away. One of my favorite expressions of this kind of uninterrupted connection is what you see when watching a good, well-trained working dog. Whether doing an agility course or herding sheep, the dog always has part of their attention on the handler, listening for the next command, watching body language, feeling intent. They are fully engaged in what they are doing, and totally ready to respond. This focused awareness does not mean our attention is exclusive. We don’t shut out everything else around us, just the opposite. We keep our attention open and receptive, our minds still. While keeping our focus on our partners we also maintain a peripheral awareness of where others are as well, especially our teacher, and on what is happening around us in the dojo. Being an instructor means zanshin on steroids. While working with one pair you need to also be able to notice the pair at the far end of the mat doing the technique in an unsafe way, and also hear the tiny bell signalling that a visitor has just walked in the front door. A teacher need to sense how the students and adjusting the teaching moment by moment. If you have ever dealt with several small children at once you have no doubt experienced this. You know where they are at every instant. Why is this one suddenly quiet? What is that one putting in his mouth? Is there broken glass on the ground? And what are the intentions of those people walking toward you from the parking lot? You can be relaxed and having fun with them, but there’s always awareness. When you’re a kid it seems that your mother can tell what you’re going to do before you even think to do it. That kind of awareness. It can seem paranoid – like being perpetually on alert, never letting our guard down. Our partner is not likely to strike us as we bow after training, and those people in the park are probably just out for a walk. But we keep our senses alive. In the bigger picture zanshin means not taking anything for granted, always being conscious, ready to act if needed. When an interaction is complete, there is still attention. Connection. When we take a weapon from our partner, we do not casually toss it back to them; we set it down just out of their reach, keeping our gaze on them, and back away. When we finish training with someone we acknowledge, thank them, and bow, completing the interaction. Zanshin means ending things in a full and organized way. Thank you for coming along on this 26-post adventure with me. 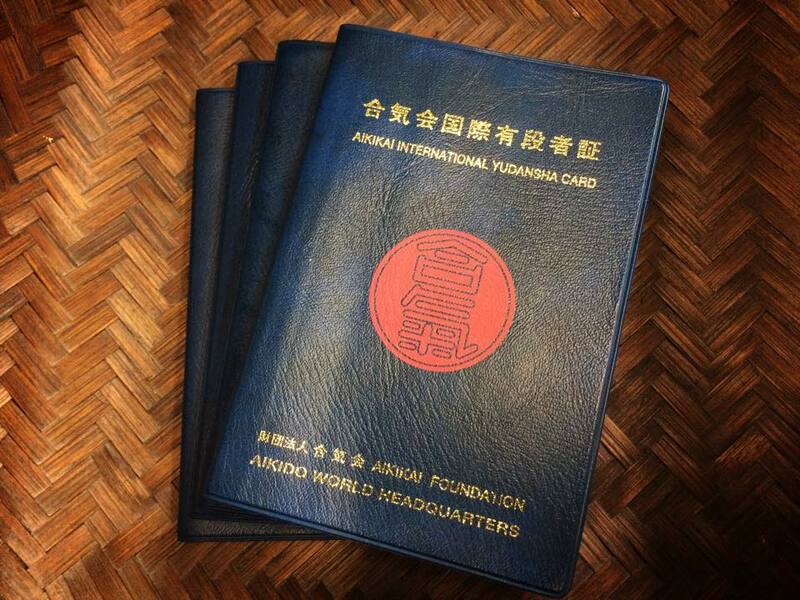 It has been great fun writing on these Aikido from A-to-Z topics. It seems appropriate that A – Aikido – Practicing Harmony – A Good Idea for Bad Times would be the first post in the series, and this post, Z – Zanshin – Ongoing Awareness and Connection, would be the last. How nice that the letters in the alphabet were conveniently arranged in my favor! I hope something you’ve read here will linger in your mind, and that you will hold a continuing consciousness of the inclusive, non-oppositional principles of Aikido. I hope we can stay connected, too. Maybe we will even meet on the mat someday. This is the twenty-fifth in this series of 26 posts, one for each letter of the alphabet, that I am writing during the Blogging from A to Z Challenge, April 2016. You can find all the posts, as they are published throughout the month, by following the A-to-Z April 2016 tag. You have seen the symbol: two tadpoles, commas, or drops, called tomoe [TOE-moy], spiraling around and flowing into one another, one white (yin), one black (yang). Within each one is a spot of the opposite color. This yin-yang symbol is called a taijitu [tie-GEE-too]. Let’s explore the meaning of it. Nothing is ever purely yin or entirely yang. The two are always in dynamic relationship. Even when something is mostly one, there is always a component of the other. Yin is feminine, earthly, rain, receptive, soft, free. Yang is masculine, heavenly, sun, assertive, hard, disciplined. Yes, yes, I know. Try not to get plugged in about feminine and masculine. It irks me, too. But these qualities are not meant to be personified in women and men. They are cultural archetypes, ways of characterizing energies or concepts, that have been in use for ages. Think of them as convenient cosmological groupings, not as prescriptive rules for human behavior. Some people speak of yin and yang separately, as if they were opposites, but they are complementary parts of a whole. Consider female and male. They are not in opposition. They do not invalidate or cancel each other out. Rather, each only makes sense in relation to the other. They join together to create life. We cannot go through life only breathing in, and never breathing out. Nothing is static. There is always movement, interplay, and balance between qualities. Daytime requires night, and up needs down. Without one, the other would be meaningless. Joy and sorrow, light and dark, north and south, water and fire, inside and outside. 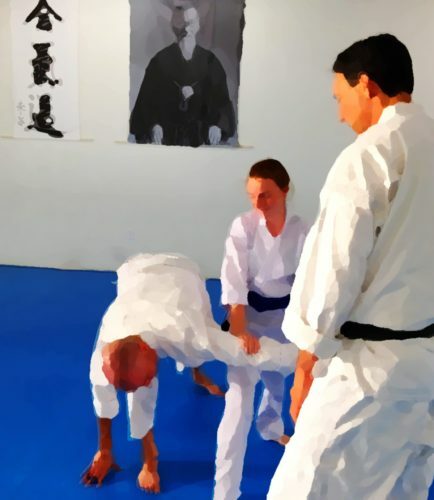 In Aikido, whether we are practicing individual techniques, or responding freely to any attack our partner chooses, we will be expressing some quality or energy – a certain feel to our bodies and movements. We might be solidly grounded today, or we might be flowing and light. These energies might come up spontaneously as part of our innate nature, or because of the kind of day we’re having. We might also elect to play with new energies intentionally, to see what’s available from each one. At one level, we can manifest a single quality, like clarity, grace, or expansiveness, and see how that affects us. But sometimes Sensei gives us a bigger challenge. He incorporates seemingly opposite energies into his teachings. For instance, we might do techniques for a while embodying discipline (yang). Then we switch to performing our techniques with a sense of freedom (yin). Gradually, we mix these two energies together, and discover that not only can we be both disciplined and free on the mat, but that it improves our Aikido. This is one of many lessons we can take out of the dojo and into our daily lives. Rather than being resolutely disciplined – serious, stern, and methodical – as a strategy for success in life, or determinedly free – capricious, flighty, and fun – as a way of expressing who we really are, what if we could combine the two? It’s not an either/or choice. We can be both, in a functional way that supports us more effectively than either one alone. Having just experienced that on the mat we are in a better position to bring it into other aspects of our life. Another pairing we have experimented with includes embodying a flowing energy, and also having a solid structure. Sensei uses the analogy of an aquaduct. Without the water in the channel there would just be a long concrete ditch. Without the walls confining the water there would just be a damaging flood. It takes both the flow and the structure – the inseparable yin-yang of the thing – for it to serve the purpose of an aquaduct. In Aikido and in life we can play with mixing flow and structure in a mature, balanced way that offers whole new possibilities. It may be human nature, or possibly our culture, that causes us to see things as exclusively one way or another. But the concept of yin-yang reminds us that many of these seemingly opposite energies co-exist, and we can access both together, to our benefit. In the dojo we develop the ability to notice this as a possibility, and to gain some ease in working with these qualities. When we are able to apply this in our work, our relationships, and our daily way of being, we become more adaptable, functional, and balanced people. This is the twenty-third in this series of 26 posts, one for each letter of the alphabet, that I am writing during the Blogging from A to Z Challenge, April 2016. You can find all the posts, as they are published throughout the month, by following the A-to-Z April 2016 tag. At most Aikido schools training with weapons is an integral part of the practice. Much of Aikido comes from working with weapons. We train with weapons to refine our technique, posture, connection, and attention. In Aikido we use wooden weapons, often referred to simply as “sticks.” Commercially-available ones are usually made of oak or hickory. Some woodworkers offer them in other woods, too. Resilience is important, since we parry and block, making forceful contact with our partners’ sticks. A weapon made of brittle wood or one with flaws in the grain could be very dangerous in practice. The bokken [BOH-ken], which is a striking or bludgeoning instrument, and also used as a stand-in for a sword, so that we may safely practice sword techniques. A bokken is about 40″ long with an oval cross-section, and a slight curve along its length. It has a handle end and a tip end, and also a front and back. In training we treat the front side as if it were a sharp edge of a blade, like a sword. This is so we can practice realistic techniques without getting into sloppy habits like grabbing the blade. That would be a problem with a real sword! The jo [JOE] is a staff – a weapon in its own right – not a wooden version of anything else. It is used primarily for thrusting or striking. A jo is about 50″ long, and is simply a straight, slender, round stick. Basically a very high-quality broom handle. The tanto [TAN-toe] is a wooden practice knife, about 12″ long. Like the bokken, a tanto has a handle end and a blade end, and a front (edge) and back. We also treat it as if it were a sharp, “live” blade. What we do with weapons. There are several kinds of practice that feature weapons. Suburi [soo-BURR-ee] are individual techniques, like a single strike or thrust. I think of these as being analogous to words. We practice suburi with the bokken and jo. In the school of weapons we practice at our dojo there are 7 bokken suburi and 20 jo suburi. Kata [KAH-tah] are set sequences of techniques that make up a choreographed solo demonstration. If suburi are like words, then doing a kata would be like reciting a sentence or two. Dori [DOOR-ee] are take-aways. We do these with all three types of weapons. Your partner comes at you with their weapon, and you take it from them, throwing or pinning them in the process. In this context we use a different word for sword, so we say tachi-dori instead of bokken-dori. We also practice jo-dori, and tanto-dori. Nage [NAH-gay] is the same word we saw earlier, under “N.” In this context it means to use your weapon to throw your partner. You have a weapon, your partner tries to take it, but you keep it, and throw them instead. These are called tachi-nage and jo nage. There are also many partner practices where both people have weapons, either the same kind (jo vs. jo) or different (jo vs. bokken). Training in most Aikido techniques requires a partner. But weapons suburi and kata are excellent for practicing solo, at home or anywhere else you have a safe, large space. This is great if you have a cold or can’t come to the dojo for some reason. At least you can get a little practice in. It’s very unlikely the someone would ever attack you with a sword, or a staff. Maybe a knife, but that’s still a long shot. Unless we are just into doing Samurai period historical reenactments, why bother? Good question. Originally I had no interest in messing around with weapons, pretending to be a ninja, swinging fake swords. Blecch. But then a few months into training I got my days mixed up and accidentally found myself in an hour-long weapons class. It wasn’t anything like I’d expected. Alignment is critical in all Aikido techniques. Weapons practice helps us work our alignment, both our own body’s posture and positioning, and our orientation relative to our partner. We develop our senses and skills around spacing and timing in all Aikido techniques. For instance, we move in as soon as our partner shows an intention to attack. In weapons partner practices, the correctness of the spacing and timing becomes immediately clear, giving us useful feedback and helping us to continuously improve. Many empty-hand techniques come from weapons techniques. Understanding their derivation can help us practice and refine the empty-hand techniques more effectively. Weapons practice, even more so than regular training, can be a moving meditation. When we are working on our own we can go slowly and deliberately, feeling our way through. We can notice more – how our breath is in sync with the motion, how we settle into a stable stance at the end of a strike, how our energy and intention is forward, directed into our partner’s center, not shrinking back, recoiling. It’s not uncommon to repeat the same suburi (a single, solo technique) over, and over, and over, sometimes hundreds of times, being aware of every detail. Training with weapons can be very challenging, and sometimes scary. Our partner is swinging a heavy stick at our head, and we have to get out of the way! It improves our ability to remain calm and respond appropriately, even when things get difficult. A sword with a live (sharp) blade is called a shinken. When we are handling one of these 3-foot long razor blades – which is essentially what they are – we need to be alert and totally present. This is not the time to be thinking about your presentation at work tomorrow, or glancing over to see who just walked into the dojo. Being distracted, inattentive, or careless could easily cost us a few fingers, or even get someone killed. There is a special sense to the attitude we have when working with live blades, right down to a specific way of handing a sword to someone. We need to have our attention fully on what we are doing, always being aware of the blade, and also aware of things around us. This intense, serious focus is also called shinken, after the word for sword. This quality of presence is desirable in all our training, and is especially important when working with weapons, even wooden ones. In Japan, the word shinken is used for the attitude we should have when dealing with any very serious issue, reflecting the life-or-death nature of the matter. Like so many things in Aikido, we can benefit in our daily life from the lessons from training with weapons. If we are able to stay calm and focused on the mat, we can take that skill out into other conflicts or challenges in our lives. This is the twenty-first in this series of 26 posts, one for each letter of the alphabet, that I am writing during the Blogging from A to Z Challenge, April 2016. You can find all the posts, as they are published throughout the month, by following the A-to-Z April 2016 tag. We discussed Uke’s role in training in the earlier post about Nage and Uke – The Relationship Between Partners. Uke provides an attack for Nage to work with, then goes with Nage’s response. It’s Uke’s job to support Nage in learning to do the technique well. Ultimately, in most cases the technique will end with Uke being taken down to the mat and held in a pin, or being thrown. Knowing how to get to the mat safely – and even bounce back up again – is an important part of ukemi, or receiving technique. It’s sometimes this aspect of ukemi – the graceful rolls and challenging falls – that draws people to Aikido. There is a lifetime of learning available in just this area of the art. Besides, falling and rolling is a lot of fun. If it’s been years (or decades) since you goofed around rolling on the lawn or doing gymnastics in school you’ll probably feel like a kid again. Some of the first things you will learn in class will be basic back falls, and slow forward and backward rolls, starting from your hands and knees. Usually one of the more advanced students will take you aside and show you how to let yourself down to the ground easily. Until you are able to do these reasonably well your partners will not throw you outright, but will give you a chance to stop and sort it out slowly without any added momentum. Sometimes the idea of going tail-over-teakettle really freaks people out. You can work through that by starting low and slow, and staying relaxed. If you get scared, back off to the previous level until you feel more comfortable. If you’ve done any tumbling or gymnastics you won’t have trouble with that fear, but you may have some habits to overcome. To do a tumbling somersault you go straight over, in a line down the middle of your back. In Aikido we want to avoid letting our head or spine contact the ground, so we roll over our shoulder, on a diagonal to the opposite hip. Our head should never touch the mat. Eventually you’ll gain proficiency and confidence, and will be able to train a bit faster. Rolling is a little like riding a bike – it’s easier when you’re going at speed, but you can’t learn that way, you have to start out slowly. Obviously the best way to learn any physical skill is with hands-on coaching from an experienced teacher. If this sounds like fun I encourage you to visit a local dojo and inquire about classes. Learning to do a thing correctly is well worth the investment in quality instruction. An injury can be very costly, in more ways than just dollars. But I’m sure you’re curious about seeing how it’s done, at least. Here is an excellent demonstration of basic, beginning front and back rolls by Rokas Leonavičius Sensei of Dodžo – Aikido Šiauliai in Lithuania. Note that the floor he is on is actually a firm mat (padded). You can try these – or at least the kneeling/sitting ones, where you don’t have far to fall – on thickly padded carpeting, a soft green lawn, or even by wearing a heavy sweatshirt or jacket for some minimal protection. Disclaimer: You know your abilities and body best; don’t come crying to me if you take on more than you can handle safely. A more advanced kind of fall is a high fall, sometimes called a breakfall, because you break the force of the fall as you reach the ground. These are used when you are thrown in a way that you can’t roll out of a technique. You have to find another way to return to the mat without a heavy thud, and of course without being injured. The idea is to land as softly as possible. There are many varieties, depending on the technique and situation. Some have inspiring names, like soft high falls, feather falls, or dead leaf falls. Imagine a feather or falling leaf wafting gently to the ground. That’s the idea. These are more challenging to learn, but well worth it. You can go your whole Aikido career without doing any high falls, if you truly are limited, physically. But my thinking is that if you can practice them, you should take advantage of the opportunity. You are likely to take an actual fall someday, slipping on gravel or ice, falling from a horse, or tripping off a curb. Knowing how to organize your body mid-flight, and land without reflexively putting your hands between you and the ground (or hitting your head!) could save you from a painful injury. Ukemi is half of Aikido. Falling and rolling are a big part of ukemi. When you train in Aikido you will spend time in class (and probably before and after class) practicing your falls and rolls. It’s tremendous exercise – great for core strength, cardio, and flexibility. You’ll develop skills that are useful both on and off the mat. And imagine the great feeling of accomplishment you’ll have when your partner can wing you across the dojo, and you land in a smooth, seamless roll, pop back to your feet, and come right back for more, laughing. This is the nineteenth in this series of 26 posts, one for each letter of the alphabet, that I am writing during the Blogging from A to Z Challenge, April 2016. You can find all the posts, as they are published throughout the month, by following the A-to-Z April 2016 tag. In Aikido we don’t call our teachers “Master.” Instead we use the title “Sensei,” which in common usage means teacher. Japanese students, whether in martial arts or other subjects, address their teachers as “Sensei.” Someone who is not formally an instructor, such as a religious leader, may also be called “Sensei”. One who has gone before. The image that comes to mind for me is someone who has walked a path before, like a backcountry guide leading a group through remote mountains. They know the trail very well. They have traversed it in many kinds of weather, in different seasons, with others before us. They can caution us about the treacherous parts, what animals to watch out for, and where the poisonous plants grow. They can help us discover easier routes around the rough bits, and point out some amazing views along the way. But they can’t have seen everything – not this particular icy fog, or that newly fallen tree. Each trip is fresh, and they continue observing and learning, even as they lead us. They face their own challenges along the way, too. The thing I love most about this concept is that one’s sensei, however worthy of admiration they may be, is just a person like us. They are not a divine authority, blessed with mystical powers. They have likely trained hard, worked long hours, and studied diligently for years. They may have forgone other opportunities in order to learn, and to pass their knowledge on to us. But they are only human. That means there’s hope for us, too. A sensei is generally regarded as wise leader, and usually is the head of their dojo community. They set the standards and the rules. They decide who will be a good fit to join the group. They may be part mentor and part coach, encouraging us to do and be our best. They may be a resource when we need advice, or a role model when we need inspiration. Our teachers may even call us out when they see us engaging in habits or thought patterns that don’t serve us, or offer alternative ways of seeing things. They do more than just stand in front of class a few hours a day, passing down collections of facts and physical skills. They are concerned with the development of our individual character and spirit, and with the growth of the dojo community as a whole. The commitment between teacher and student works both ways. As students we have a responsibility to support our teacher. When we join a dojo it’s implied that we are committing to doing our best to learn what our sensei is teaching. Through our showing up, by being their students, we provide the context for their own ongoing process of development in the art. This is our side of the relationship to uphold. In this way the teacher/student partnership is similar to that between training partners, Nage and Uke, that we discussed earlier. Just as Uke is an active participant in creating Nage’s technique, so students are active participants in the teaching that happens at the dojo. Apathy, inattention, denial, cynicism, or resistance don’t serve anyone. Conscious, engaged attention and a generous spirit help us all grow together. Most martial arts teachers are truly decent, good-hearted people. Teaching requires long-term commitment to the art, and serious sacrifice in other areas of life. No one gets into the profession to get rich or famous – they do it from love and service. But one may be a better match for your temperament or learning style than another. If you find yourself training with a teacher you do not admire or respect, or whose teaching does not speak to you, keep looking – you aren’t doing yourself or the teacher any favors by staying in the wrong place. If you train in Aikido or another martial art your sensei will likely have an influence on your life on par with your family, religious leader, or closest friends. When I initially chose where to train I considered the class schedule, noted that the dojo was roughly between work and home, and saw that the place seem professionally run and well maintained. I was impressed that the chief instructor had degrees in philosophy and teaching, in addition to a high rank. Good enough. Convenient, affordable, legit. Count me in. But I had no idea… I feel very fortunate to have found my teacher, who has had such a powerful and positive influence on my life. This is the eighteenth in this series of 26 posts, one for each letter of the alphabet, that I am writing during the Blogging from A to Z Challenge, April 2016. You can find all the posts, as they are published throughout the month, by following the A-to-Z April 2016 tag. When I first heard Sensei speak about “ruthless compassion” I was sure he was saying it backwards. He must have meant compassionate ruthlessness – tempering our ruthless nature by expressing compassion toward our partner. You know, that whole “protecting our attacker” thing we always hear about in Aikido. He kept saying it wrong, though. Weird, because he’s very articulate. He taught English for years. You’d think he wouldn’t mix it up like that. I don’t know when it finally sunk in. At least two years into training. “Ohhh!” He meant exactly what he was saying. Ruthless compassion. It was just such a foreign concept to me that I couldn’t hear it. So, what is ruthless compassion? My current understanding of what Sensei means is that we can be absolutely clear, with no question about it, without becoming belligerent or aggressive, when taking charge in a situation. We can have boundaries, assert ourselves, and manage conflict while keeping our center. We can calmly, deliberately do what’s required to bring about a good outcome. Remember that we can think of an attacker is as someone who has lost control, and is posing a danger to us, to others, or to himself or herself. The compassionate thing to do is to manage the situation, to get them safely under control. We can do this without hostility, and without hesitation. An act of compassion, performed ruthlessly. An example Sensei sometimes gives is that of firmly refusing to let one’s child eat cookies for dinner. Cookies are OK in their place, but aren’t a complete meal. Besides, the family is having salmon and vegetables tonight. That seems obvious enough. A direct, clear statement. And in this context it seems easy to to. The parent is responsible for the child’s welfare, and is in a position of authority. Of course they should not let their kid have a dinner of just cookies. The parent is doing, without pity, what is best for the child. You can see that neither of these would be an optimal way of communicating what’s going to happen with regard to cookies and dinner. Let’s hang out with verbal communication for the moment, since it’s an easy way to illustrate the concepts at work here. It’s plain that those aren’t the best responses when dealing with one’s child. How often do we find ourselves saying something similar in other contexts? At work, in traffic, in relationships? Both kinds of responses are inappropriate. One way is wimpy, whiny, and powerless. The other is angry, confrontational, and reactive. What if we could just be grounded and direct? For many of us, at least in some situations, directly expressing where we stand, without pleading or becoming argumentative, can be very uncomfortable. We haven’t had any experience with it. It feels awkward. What if we could practice it somehow? Make it our default, natural response. Get it into our bones. Practicing ruthless compassion in the dojo. There are – of course, there always are – physical manifestations of these ways of dealing with conflict. Our physical presence is a kind of communication, more powerful than any spoken words. In reading the words above it’s easy to visualize the speakers in each case, and imagine their body language. Closed posture, eyes down, hands clasped, or leaning forward, red-faced, fists clenched. These same habitual and inappropriate responses to conflict often reveal themselves on the mat. Some of us may find ourselves hesitant to attack with conviction, or to take our partner’s balance (a critical component of most Aikido techniques). We may hold back, or feel unsure. We may not want to seem mean or rude, or we may be afraid of hurting or upsetting our partner. I have (many times) heard fellow students say “Oh, gosh, I’m sorry,” for simply executing a technique well, and throwing their partner with solid form and powerful energy. They are not used to asserting themselves, and don’t want to be a bother. It can be a shock to their system when they take decisive action. Alternatively, we may find ourselves being forceful or pushy. We may notice that our attention is on getting the better of our partner, and “winning.” We may get reactive and aggressive when we perceive an attack, even in friendly training. Noticing these dysfunctional tendencies on the mat gives us an opportunity to look and see if we are doing similar things elsewhere in life, too. Do we meekly give others’s needs priority over our own? Do we stand by and watch when we should step in and take charge? Do we bully our way through interactions, getting our way without concern for our affect on others? By deliberately, consciously, mindfully training we can learn to practice techniques with assertive, clear energy. Ruthless energy. What’s more, we can do so while maintaining our compassionate goal of ending the threat while caring for our attacker. It is through such embodied practice in resolving conflict in a better way, that we can not only be more effective in our Aikido, but more effective in life.